When you're dealing with electric stoves, you will typically find two designs: radiant and ceramic. While these two types of cooktops are similar, the main difference between is the actual surface of the stove. Selecting between these two types of cooking surfaces depends on your price range as well as the desired look you want for the kitchen. The type of cooktop you use helps determine the quality of your food. Radiant cooking refers to the heat transfer from a main heating source to another object. In the case of a cooktop, a radiant appliance is one that effectively transfers heat through the bottom of pots and pans. A common misconception is a radiant cooktop is the same as a ceramic cooktop; however, radiant cooking also refers to coil elements, gas elements and induction cooking elements. 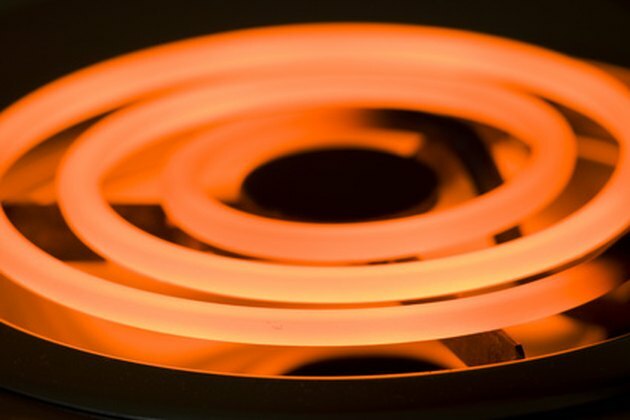 A common radiant cooktop is a coil element stove. Basically, this cooktop features a coil of metal that is heated up to red-hot temperatures. The heat generated from these coils is then transferred through the cooking vessel. A gas radiant element traditionally features grates that elevate a pot over the burner. When the gas element is activated, it heats the cooking vessel through controlled flames. A ceramic cooktop gained its name as the surface of the cooktop is manufactured from ceramic glass. The main benefit of a ceramic cooktop is its easy cleanup. After you are done cooking, spray the surface with a ceramic cleaning solution and wipe clean. Ceramic cooktops are also designed to enhance the heat transfer from the hidden radiant element to the bottom of the cooking vessel. The exact benefits of a ceramic cooktop depend on the manufacturer and model of the appliance. The main drawback for a traditional radiant element cooktop is its uneven cooking surface. Coil elements and some gas elements are elevated from the surrounding surface, thus raising the risk of cooking vessels tipping over. When it comes to ceramic glass cooktops, the main drawback is its difficulty to repair. Because the heating elements are hidden under the glass surface, repairing or replacing cooking elements is a challenge. The price for a traditional coil radiant cooktop is significantly lower than its ceramic glass counterpart. As of 2011, the GE Built-In Electric Cooktop, Model JP328BKBB, is priced at $350 while the comparable GE Profile Built-In CleanDesign Cooktop, Model PP962TMWW, is priced at $1,000.